While the Libyans said they had liked Cynthia McKinney in the past, especially her work in support of Gaza, they were here to set her straight about Qaddafi and Libya. 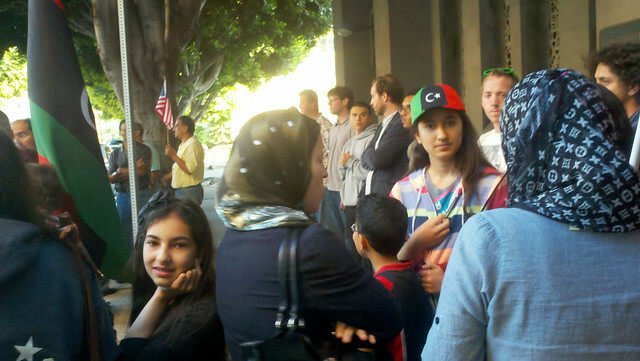 I had seen some of these Libyan activists before, at the first LA rallies in support the uprisings in Tunisia and Egypt. This was before ANSWER took up those struggles. I didn't see any pro-Qaddafi Libyans that evening, either outside or inside the church. No Libyans were on the program and the green flag of Qaddafi's Libya was nowhere to be seen. If there were any pro-Qaddafi Libyans in attendance, they never revealed themselves. As far as I could make out, all of the pro-Qaddafi people in attendance, including Cynthia McKinney, were non-Libyans and all the Libyans who showed up were anti-Qaddafi. So ANSWER showed them how we do public forums in the land of the free and the home of the brave. They excluded the Libyans from the Libya Forum! Not only did ANSWER tell them that they would not be allowed to pay their $10 and attend the event, a line of ANSWER people formed a human wall to divide the sidewalk between and us and them. When I exclaimed "They're keeping the Libyans out of the Libya Forum." one of the ANSWER people forming the wall told me "We're not keeping them out because they are Libyan. We're keeping them out because they support the intervention." This left me contemplating which was the worst reason for keeping people out? Keeping them out because of their nationality or keeping them out because of views contrary to those of the forum organizers? Of course, opposing NATO's intervention is a very easy and moral position to take for those that have lost no family to Qaddafi and didn't stand to lose any no matter how many Graf missiles and cluster munitions he was given free reign to use on cities under siege like Benghazi and Misrata. They have nothing to lose by keeping their hands cleanly in their pockets and taking the moral high ground. "it is an undeniable fact that the relations between the US and its NATO allies with Libya in the recent years were excellent," adding that Libya "opened up strategic sectors as the production and distribution of oil to foreign investment" and that "many state-owned companies were privatized. The IMF played its role in implementing these policies." ... "Aznar was full of praise for Qaddafi, and he was followed by Blair, Berlusconi, Sarkozy, Zapatero, and even my friend the King of Spain; they all queued up under the mocking smile of the Libyan leader. They were pleased... I simply ask why they now want to invade Libya and send Qaddafi to the International Criminal Court at The Hague?" The reason, Mr. Castro, is that they realize, even if you don't, that the Libyan people have finally lost all fear of Qaddafi. He cannot survive, he will he done as soon as his money runs out. His dictatorship is done and NATO has in the last hour thrown him under the bus to help their play for a future role in Libya. Cynthia McKinney and ANSWER say nothing of this, just as they say nothing of the more than seven thousand Libyans that the opposition says that Qaddafi has killed. Later in San Francisco, McKinney puts the total number killed at "four thousand and some dead".. "but of course the bulk of that would have to come from the NATO bombing because they're using bunker buster bombs." [YouTube 07:15] For his part, Qaddafi claims that about eight hundred civilians have been killed by NATO bombs but there are many reasons for questioning even that number. For example there was that embarrassing incident a couple of weeks ago when Libya officials took foreign reporters to a hospital to view a baby girl they said was injured in a NATO air strike. The whole fraud unraveled after a hospital workers passed a reporter a note saying the girl had been injured in an automobile accident. Latter some of the reporters spotted the "concerned uncle" at another Qaddafi dog and pony show and he was forced to admit that he worked for the Libyan government. The "Kuwait baby incubator" fraud comes to mind only this time NATO is the victim, not the perpetrator. Fidel Castro may support Qaddafi but he knows that the uprising in Libya is part of the Arab Spring and flows from the real concerns of the people, saying "Without any doubt, the faces of the young people who were protesting in Benghazi, men, and women wearing the veil or without the veil, were expressing genuine indignation." After decades of living under brutal dictators and being exploited by their imperialist masters, the people rose up, first in North Africa and then in the broader Middle-East. Peaceful protests against Qaddafi were already developing in Libya in the middle of January as Ben Ali was being thrown out of power in neighboring Tunisia. They were spurred on my the ouster of Mubarak in their eastern neighbor, Egypt, less than a month latter. The causes for the uprising in Libya have been essentially the same as they have been throughout the whole region, beginning with rising food prices and growing unemployment and ending with fearless rejection of long established dictators. The people rising up in Libya have been largely working class, as they have been in Egypt and Tunisia. But there have been differences. In Tunisia and Egypt, the people were able to throw out dictators that had ruled for 20 or 30 years quickly and with relatively little bloodshed because the army refused to open fire on peaceful protesters. In Libya they did not refuse such orders. Eventually the protesters took up arms and started fighting back. The uprising became a civil war. But that's not how ANSWER sees things. Since they missed the non-violent phase of the Libyan opposition, to them it never existed. They see the rebels as the same as contras. They are all paid agents of NATO, tools of imperialism, etc. They weren't paying attention until the UN and NATO got involved. 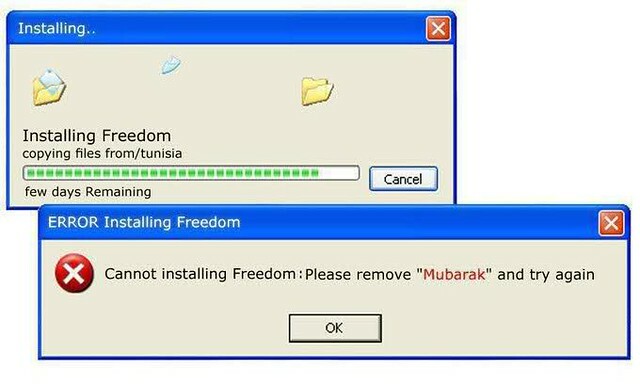 They didn't express any public support for the uprising in Tunisia until after Ben Ali had been ousted. They didn't support the uprising in Egypt until 29 January. Compare that to the hacker group Anonymous, which started OpTunisia on 2 January and OpEgypt on 23 January. When it comes to Yemen and Bahrain, ANSWER has spoken out in support of the uprisings and against the repressive, US backed regimes. But when it comes to Libya and Syria, with their "anti-imperialist" dictators Qaddafi and Assad, it's a different story. In those countries they don't support the Arab uprisings. In fact, they don't even recognize those struggles as part of the Arab uprising. Because those leaders have a reputation for opposing NATO, they support the government violence and act like the people have no right to rebel. Whatever NATO is for, they are against. Whatever NATO is against, they are for. That is the western centric way they view the world. In this perverse way, they tail after their own bourgeoisie. They don't support the people's revolutionary struggles in a steadfast way. Western powers bring death and destruction, nothing else. This must be a starting point for activists located in the United States and Europe when it comes to the Libyan revolt. Ultimately the problem PSL will have with their starting point is that they can't lead by taking a reaction as their starting point. An alternate starting point might be "steadfast support for the people's revolutionary movements irregardless of stand taken or pretended by the US." That is a starting point that doesn't have to wait for and react to what the Western powers do. That is a starting point that demands our attention and support as soon as a people act to liberation themselves. That is also a starting point that requires that we have an organic connection to those movements. It is a starting point that demands that we take the focus off of ourselves and what our government is doing about it. These questions don't occur to McKinney as she goes on to state that the United States is "a poor trumpet" for democracy because of its own legacy of oppression, from "genocide of indigenous Americans to enslavement of stolen Africans to disfranchisement of women..." This, ironically, is just a perverse form of patriotism. For McKinney, the whole question is about America [my bold]—certainly not about the Libyans, who deserve democracy entirely apart from the United States' moral credibility to advocate for such. This is a cynical and dishonest distraction of the lowest order. And that, finally, is why the Libyans had been excluded from the Libyan forum. It really wasn't about them. Whereas Castro sees an attempt to subvert a revolution, "Imperialism and NATO – seriously concerned by the revolutionary wave unleashed in the Arab world, where a large part of the oil is generated that sustains the consumer economy of the developed and rich countries – could not help but take advantage of the internal conflict arising in Libya so that they could promote military intervention. "; they see the Libyan uprising as CIA/NATO intrigue from top to bottom. Perhaps it is this simplistic view that leads them to abusing Libyans who attempt to attend their Libya forums. After Cynthia McKinney spoke she showed a film they had made in Libya. The core of it was one bloody scene after another showing what NATO ordinance had done to Libya soldiers; missing were the women and children that should have been very prominent if indeed 800 civilians have been killed in the bombing. The Qaddafi government clearly was providing the visuals for this film and dead children would have been high on the list if they had any at that time. In the Q&A that followed, it became clear that at least one Libyan had gotten in and he was against Qaddafi. He was booed. Cynthia McKinney has been a little vague about who paid for this trip. She said that when she was in Tripoli earlier she decided that she wanted to return with others on a truth telling mission. She was able to borrow the $25,000 cost from an unnamed friend, who "I have to pay back." Hence the collection at the door and the latter passing of the plate. While it is pretty clear that this friend with 25 grand to spare is also a Qaddafi supporter, since we don't know who he is, we can't know what political and economic ties he may have to Qaddafi. This raises a lot of questions about the whole trip and tour. In any case, it's too bad they didn't let the Libyans in. She could have been a couple hundred dollars closer to her goal. San Francisco was Tuesday. San Francisco was different. ANSWER didn't keep Libyan's out of the Cynthia McKinney Libya Forum in San Francisco on Tuesday 21 June but they had other ways of letting them know they weren't welcome. An ANSWER Coalition supporter told the Libyans to "go back home." [YouTube] When a Libya women became offended and said that she takes it very personally because most of these Libyans are exiles, she has family in Libya, she has an uncle in his prison and Qaddafi has killed three of her cousins, she is told my one person that if she takes it personally she should take it outside and my another to "grow up." They also tried very hard to avoid calling on the Libyans in the Q&A. When they failed, it led to some interesting exchanges. When a Libyan man ask Cynthia McKinney why she made no mention of the over seven thousand Libyans killed by Qaddafi in suppressing the uprising, she responded that "it is the right of the Libyan people, in my opinion, to solve their problems among themselves without NATO bombs and missiles." [YouTube] That got a big round of applause from the ANSWER supporters. As was pointed out in Arming Gaddafi, and other places, many of the weapons Qaddafi has been using against his own people have been supplied by NATO countries, but these aren't the NATO weapons that McKinney opposes. She hasn't objected to NATO countries selling Qaddafi millions of dollars in weapons, which he is now using to put down the rebellion, but she has been most vigorously objecting to NATO doing anything to right the balance. We all know that NATO is not a bunch of boy scouts, but the larger and more dangerous doctrine that Cynthia McKinney, ANSWER, and all the "non-interventionist" appear to advocate is that the international community has no right to set limits on the level of violence a state may use to put down uprisings within its borders. Syria, Yemen and Bahrain are all now expanding the reach of that doctrine with all it's frightful consequences. She may not realized it but this stance she is taking with regards to Libya also justifies Israel's vicious suppression of Gaza, which she has so courageously opposed; because a necessary corollary to the thesis that the world has no right to interfere with what a state does within it's own borders is that the world has no right to tell a state what those borders are. Qaddafi understands the Gaza connection, that is why he uses the example of Israeli to justify his own actions, telling France24 "even the Israelis in Gaza, when they moved into the Gaza Strip, they moved in with tanks to fight such extremists. It's the same thing here!" He was referring to Operation Cast Lead, which Israel launched against the Gaza Strip two days after Christmas, 2008, killing at least 1,400 Palestinians. See Gaddafi: Crackdown modeled after Israel. Weeks before NATO started bombing, Qaddafi was carrying out a Israeli styled crackdown on the Libyan people and this is what Cynthia McKinney is demanding not be interfered with. In response to another Libyan who managed to ask a question, Akbar Muhammad from the Nation of Islam said "The way I'm going to answer my Libyan brothers [is] there's a way to go about it. You could have called for a referendum. Look at when those African leaders came to Benghazi, the people in Benghazi ran them out, these African heads of state. Now if you really wanted to do it, you could tell America, if you want their help, say "What we want is a vote"... "Could you come in, instead of bombing, supervise a referendum, so that the Libya people could say if they want Mummar Qaddafi or some other Westminster democratic process." That got a laugh. Of course he is in the United States, not Benghazi. He can talk about the Afro-American struggles and then tell the Libyans "your situation is not unique." He can arrogantly forget that a few days before NATO started enforcing the no-fly zone, Qaddafi told Benghazi "We will show no mercy..."
Remember the circumstance under which Muhammad is suggesting they should have called for a referendum. Qaddafi's forces had just flatten the small town to the west of Benghazi, killing hundreds with aircraft, tanks and artillery. "The town of Ajdabiyah has been cleansed of mercenaries and terrorists linked to the al Qaeda organization," Libyan state TV bragged. Now Qaddafi was promising to "go house to house" and "kill the rats", meaning Libyans, in this city of almost a million. This was on the eve of the UN vote on resolution 1973. Libyan League for Human Rights chief Soliman Bouchuiguir, said that if Qaddafi was allowed to attack Benghazi there would be "a real bloodbath, a massacre like we saw in Rwanda." That is why the Arab League voted for intervention. That is why the first NATO air strikes were around Benghazi. Whatever their motivation, the NATO actions almost certainly did stop a bloodbath in Benghazi. This is an inconvenient truth for Qaddafi supporters. But when you're not in a difficult situation it can be very easy to be judgmental. I will tell you frankly that I don't like the police. I know that they have gotten away with murder too many times. I have seen them lie, torture and act like thugs. On a personal level, police have threatened to murder me and I have done time in jail because police lied on me. Still, if I happened to be threatened by gangsters or if my child is kidnapped, I will call the police. And I don't think Ho Chi Minh was an imperialist tool because he allowed US OSS doctors to treat him or because he accepted US military help in his struggle against the Japanese. However, I think it was absolutely shameful the way Stalin sent Molotov scurrying off to Washington to beg the United States to step up it's war against Hitler in 1942. Imagine that! A union of socialist republics demanding the US imperialists help them in their war with German imperialists by intervening militarily in a European affair. Didn't they know the US reputation for wantonly killing civilians, from the Indian wars or the Philippines for example? Shouldn't they have been able to anticipate the hell on Earth the US and British imperialists would create for the civilians of Dresden and some one thousand other German town and cities they incinerated in the final months of the war? Of course, that was after the Hitler-Stalin pack broke down and Hitler invaded the USSR, before that [Daily Worker, 1940] it was "the Anglo-French Imperialist war machine." UPDATE: How do Libyans in Tripoli feel about the NATO bombing of their city? @KernelThread We don't need to rebuild gaddafi's compound. In fact we need help to tear it down. His compound takes up tens of square kilometres and houses his own palaces and security. The OVERWHELMING consensus in tripoli is that we want it to be turned into a green park for EVERYONE to enjoy. So we will be tearing down the buildings anyway. The﻿ rest of civilian Tripoli is untouched by NATO. Compare it to gaddafis indiscriminate bombing of misrata - now THAT we need to rebuild!